Each country further applies additional sub-categories beneath the universally agreed upon 6 digit HS provisions in order to track more precisely the commodities and products they are most interested in “protecting”; i.e. monitoring and taxing. These subcategories (great-grandchildren, great-great grandchildren, etc.) can generate branches of 8, 10, 12 or more digits. “The Harmonized Tariff Schedule of the United States (HTS) is the primary resource for determining tariff classifications for goods imported into the United States (and can also be used in place of Schedule B for classifying goods exported from the United States)”. 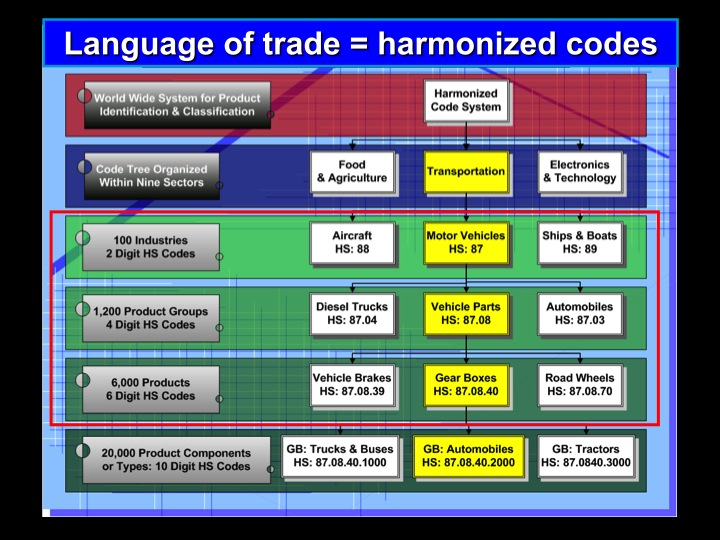 There are over 17,000 unique ten-digit HTS classification code numbers. One of the very first tasks that many Trade Consultants undertake in working with a newbie importing or exporting company is to help them assign the appropriate HTS codes to their respective product(s). Most U.S. companies don’t have a clue. In China, I think they learn the HS system in elementary school along with English. Improperly classified products are likely to have a very difficult journey through Customs and incur additional costs. One of the biggest problems in the process of transforming trade data into trade intelligence is inherent in the HTS nomenclature. It is extremely obtuse. The descriptions are almost impossible to understand. The classification “logic” varies from chapter to chapter, category to category. The most commonly used term is the ever endearing and everlasting designation: NESOI. No, it’s not a type of plastic, article of clothing or technological component. It means, NOT Elsewhere Specified Or Indicated. World-wide imports and exports of NESOI have experienced exponential growth during the last 10-20 years during the information age. By and large it’s all a form of Trade Technocracy, a malady which I have spent a sizable portion of my tenure as a Trade Intelligence Professional attempting to remedy.